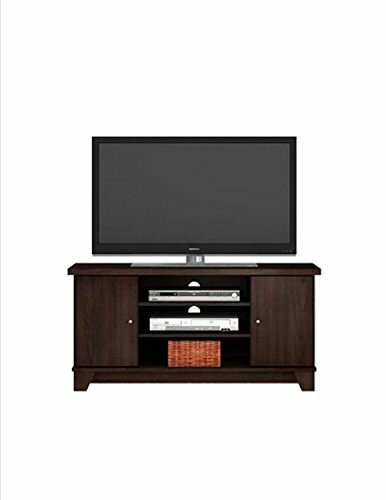 This beautiful TV Stand is the ultimate home entertainment center that offers you the choice of viewing the TV from anywhere in the room. The thick top with gives the cart an appealing look. The two doors have metal door pulls that open to a large storage area, that is finish in a black laminate, for all of you nick knacks. The middle shelf is adjustable to handle all of your electronic needs The tapered legs on each corner and skirt give this unit a free standing designer look. Constructed of Composite Board with durable PVC laminate. Clean with a dry non abrasive cloth. Assembly is required. W. Designs X-Frame Metal and Wood Media Bookshelf Barnwood 60"